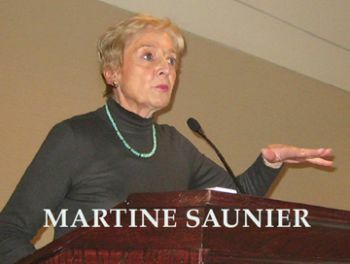 Last January, Boston welcomed Martine Saunier with heaps of snow, freezing temperatures, and biting winds. She was a speaker at the 2O11 Boston Wine Expo. She lectured about her life and work as an importer of French wine. As she spoke, she guided the audience through a tasting of 9 wines. A minor illness kept her from sampling the wines with the us. She told stories about the producers as they tasted. I have edited her comments and have included, at the end of this article, my own impressions of the wines she presented. Saunier entered the wine business in 1969 in San Francisco. She moved away from a career in public relations to take on a job working for a wine importer. It was a natural for her because it combined her skill in communicating with her love of wine. This love was founded on childhood experiences at her aunt’s vineyard in the Maconnais. Two influences made a great impression on Saunier. One was her “mentor” Henri Jayer, a wine producer in Vosne in Burgundy. The other was the wine estate, Chateau Rayas, in the Chateauneuf-du-Pape in the Rhone Valley. Saunier gives credit to Jayer for showing how it was possible to craft the “pure” wines “with good acidity and balance” that Saunier preferred. He showed her how vineyards should be properly tended and how to vinify the wine in order to maximize its quality. Saunier met him in October 1978, a year before she started her own importing business. She had been invited to taste the 1978 wines of Domaine de la Romanee-Conti. “They were fabulous.” Later in the day, she went to Henri Jayer and tasted his 1978s. “There was no comparison. Jayer’s wines were even better!” Saunier used all the money she had invested into her new company to buy as much of Jayer’s wine as possible. Then, in her words: “I made him known in California. His fame swept across the United States helped in large part by the acclaim of Robert Parker. Finally he became known in his own country, France. The French did not know the jewel they had.” Of the many prescriptions that Henri Jayer advocated, Saunier mentioned the avoidance of chemical additions to the vineyard, low production per plant attained in part by short pruning, the omission of fining and filtration, and the purchase of the highest quality barrels possible. Saunier insisted that her own suppliers embrace Jayer’s practices. She worked with as many as three generations of wine producers at the same estate, grandfather, father and son. As the young came of age, she sent them to Jayer to learn. She told us with her index pointing up at the spirit of Jayer, “He would straighten them out.” He passed away in 2OO6. “Don’t you know Chateau Rayas?” the owner replied. Lunch was over. She looked at her watch. It was 2pm. Saunier looked up and asked the owner, “Please give me the address of Chateau Rayas.” Directions in hand, the adventure began. Saunier sped off in her car. After many detours on windy, dusty, unmarked roads, she found Rayas. It was 4pm. It should have taken half the time. No one was at the winery. She went to the private residence and knocked. An old lady opened the door and said, “Monsieur Reynaud is taking his siesta. “ Not wishing to disturb him, Saunier waited in the shade of a tree. After some time, Monsieur Louis Rayas emerged, a beret atop his head, gold-rimmed spectacles framing his eyes. He was small and wiry, weighing in at, according to her, less than 9O pounds. He brought Saunier into the winery. With him, she tasted the 1959 and 1961 Chateauneuf-du-Pape. She was stunned by the personality and quality of the wines. My own response, sitting in the audience, was how low the price had been. Recent releases of Chateau Rayas red have cost about $15O per bottle at retail. surrounded by forest. Grenache is planted for red wines. Grenache blanc and Clairette are planted for white. Pignan is a designated vineyard within Chateau Rayas. In 1945, Louis Reynaud purchased Chateau de Fonsalette, a separate estate of about 1O hectares about 2O miles north of Rayas. It has its own facilities. Syrah is planted there among other varieties. There is even a varietal Syrah wine offered by Chateau de Fonsalette. The principle characteristics that mark Chateau Rayas and Chateau de Fonsalette have been old vines, low yields and traditional winemaking techniques. Vines average about 35-years-old. The production at Rayas is 15 hectolters per hectare. Chateau Rayas, in particular, employs large barrels, some of which are over 1OO-years-old. During the forty plus years that Saunier has been working with Rayas (“I have never missed purchasing a vintage.”), Louis Reynaud has passed the baton to Jacques his son and then Jacques passed it to Emmanuel, his nephew. Though Emmanuel has brought his own family estate of 4O hectares, Chateau des Tours, and some new equipment, Saunier prevailed upon him to retain the 1OO-year-old barrels for Chateau Rayas and to leave the walls in their vicinity blackened by mold. As she described each producer, the audience tasted a representative wine. The first four wines were red Burgundies arranged in ascending order of appellation. They were Marsannay AOC lieu-dit, “Les Favieres” 2OO6, from Charles Audoin, Aloxe-Corton AOC “Vieilles Vignes” 2OO6 from Michel Gay & Fils, Gevrey-Chambertin “Les Champeaux” Premier Cru AOC 2OO7 from Denis Mortet, and Chambertin-Clos de Beze Grand Cru AOC 2OO7 “Vielles Vignes” from Perrot-Minot. All four were carefully made wines in the style that Saunier had described. The wines never veered far from expressing pure cherry-spice Pinot Noir fruit. What were the most evident differences were the increasing color, body, astringency, and impact of newer oak barrels. The next three wines were from the Rhone Valley. Famous wine producers Laurence Feraud of Domaine du Pegau and Andre Brunel of Les Cailloux have become partners in negociant firm, Feraud-Brunel. The Chateauneuf-du-Pape Rouge AOC 2OO7 from this company had a smokey-violety-gamey nose. I asked Saunier if this was due to wild yeasts. She told me that it comes from the 2O% of Mourvedre and Cinsault in the blend. I also smelled very ripe, if not slightly overripe, fruit. My favorite red wine of the tasting was the Chateauneuf-du-Pape Rouge AOC “Pignan” 2OO6 from Chateau Rayas. It had the pale red brown core with orange rime typical of Grenache. The nose was floral and showed ripe, red fruits. There was a hint of smoke in the finish. The wine was delicate and pure. I preferred less the leading wine from the estate, the Chateau Rayas Chateauneuf-du-Pape Rouge 2OO6. Old barrel spice distracted my attention from the fruit smells. Both Rayas wines had the lightness and elegance of Grenache grown on sandy soils. Saunier finished the seminar with bubbles – two Champagnes. The first, a Blanc de Noirs Premier Cru NV from Gonet-Medeville was copper-tinted. Its nose was loaded with quince and it was rich and round in the mouth. The second, a Blanc de Blancs 2OO4 from Diebolt-Vallois was straw-green in color. In the nose, I identified hawthorn and green apple. The mouth was a bracing sour rash, much to my liking. Saunier brings in artisanal wines that are honest and elegant. (I except the Feraud-Brunel Chateauneuf-du-Pape from the descriptor, elegant. Why shouldn’t honest, brutish wines have full citizenship in the our nation of wine appreciation!). The wine industry needs more importers like her, clear-headed businesspeople with a clear vision of who they are and what they like combined with a talent for communicating that vision. *Saunier is also widely recognized as being the US importer of the wines of Domaine Leroy in Burgundy. Perhaps because there were no Domaine Leroy wines in the tasting, Saunier briefly noted that the perpsectives of its proprietor, Lalou Bize-Leroy, are similar to those of Jayer and that the yields of her Domaine are as draconian as those of Chateau Rayas.